Recently my health insurance provider decided that they wouldn’t cover allergy medications any more which is a big blow to my health. When one goes to an allergist for the first time, the allergist will test you for 80 most common allergens. I am allergic to 78. Have been since I was a child, and they haven’t changed in over 40 years, despite repeated testing every seven years. For the first thirty years of my life, I coughed, hacked, and sniffled my way through life, never without huge wads of tissues in hand and rarely able to breathe through my nose. The advent of new medications, specifically nose sprays, seemed an opportunity for relief. True to my life, though, it turned out I was allergic to most of the new medications. Go figure! But there was one which actually worked, and for the past 15 years, I was able to breathe through my nose, divest down to one tissue a day, and only hack, cough and sniffle two or three times a year when the allergy seasons were at their worst. Now, though, I’ve slowly begun a descent back to what I had forgotten, not being able to breathe unless completely upright, blowing my nose so often that it’s red and raw, once again needing to invest in my own tissue company, and finding myself at the doctor’s more than I’d like to be for antibiotics for sinus infections. On the plus side, I’ve been so sick at times that I’ve been forced to stay at home which is an unusual opportunity for me because I suddenly have time which I wouldn’t have had if I were out at my usual meetings and running of errands. It has also meant I can see firsthand which parts of my life really must be attended to and which can survive without me. On the downside, feeling unwell makes me tired which stimulates cravings for food which aren’t always the healthiest of choices. Since I always have to watch my weight and my sugars, I have been trying to create comfort foods which curb my cravings but which are healthy. One such recipe is for a quinoa salad. If you are unfamiliar with quinoa, it is essentially a seed which is a good protein source. Because it cooks similarly to rice, folks tend to eat it like a grain, and folks who are diabetic or needing to watch carbs should know that quinoa is high in carbohydrates. Since quinoa is also high in protein and fiber, though, eaten judiciously, quinoa is a great comfort food. 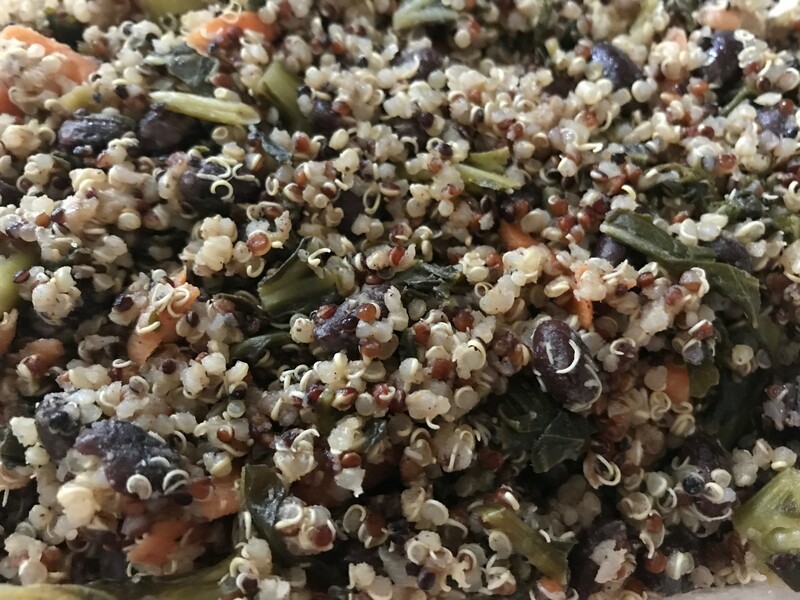 I make a quinoa salad which I and my family really likes which uses multi-colored quinoa, black beans, kale and carrots. The quinoa and black beans provide the carbs which are filling but also fiber and protein. The kale and carrots provide nutrients gained from vegetables and cuts the amount of quinoa (and hence the carbs) in a cup serving. In a medium saucepan, pour the water and add the quinoa. Bring the water to a boil, then lower the heat and simmer until the quinoa has plumped, is showing white rings, and has absorbed all the water. This will take anywhere from five to 15 minutes, depending on how vigorously you are simmering the water. I find that it’s helpful to stir the quinoa every so often. Once the water is absorbed, remove the pan from the heat, cover the quinoa and let it sit. You want the quinoa to be completely dry before you mix it with other ingredients. This can take anywhere from 10 to 30 minutes, depending on how much of the water was actually absorbed into the quinoa before you removed it from the heat. When it’s completely dry, you will be able to fluff the quinoa with a fork. If the quinoa clumps together when you try to stir it, then it’s still a bit damp. While the quinoa is drying, thinly slice baby carrots to make a cup. You can use regular sized peeled carrots but then you’ll want to cut the thin slices in half because you are only cooking the carrots a short amount of time in the microwave with the kale, and you don’t want the carrots to be hard. Once you have a cup’s worth chopped, put it aside for the moment. Put 2 cups of frozen, chopped kale into a microwave safe bowl. Follow the instructions for cooking, only halfway during the cooking time, remove the bowl, stir the kale and add the cup of chopped carrots. Finish cooking the kale in the microwave. Add the kale, carrots and black beans to the quinoa and mix well. In a measuring cup, whisk together the olive oil, apple cider vinegar, salt, pepper, cinnamon and cumin and honey, if using. Drizzle the dressing onto the quinoa salad and use a spoon to incorporate the dressing into the quinoa salad. Salad can be served warm or cold. Can store in the fridge for a long time. Thank you for posting this. I had already forgotten some of the ingredients you had mentioned.